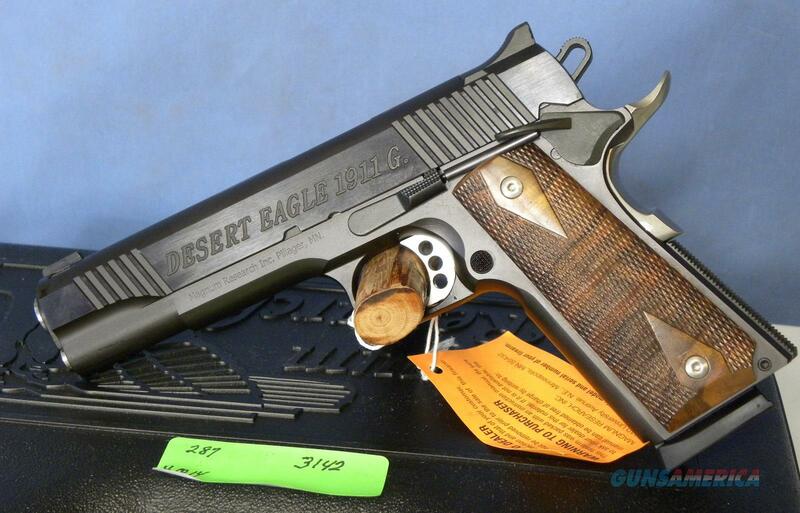 Description: NEW MAGNUM RESEARCH "DESERT EAGLE" 1911 TYPE PISTOL IN 45ACP. THIS PISTOL HAS THE CLASSIC 1911 TYPE BLACK FINSH WITH A SAO TRIGGER AND WOOD GRIPS, FIXED SIGHTS, 5" BAREL, BEAVERTAIL GRIP SAFETY AND EXTENDED THUMB SAFETY. COMES WITH TWO 8 ROUND MAGS, HARD CASE, MANUAL AND TRIGGER LOCK. THIS GUN WAS MANUFACTURED IN ISRAEL AND HAS A LIFE TIME WARRANTY.